Friday, August 17th, 11 a.m. – 10 p.m.
Saturday, August 18th, 11 a.m. – 10 p.m.
Sunday, August 19th, 11 a.m. – 8 p.m. This festival has annually raised money to complete their beautiful church, and has successfully done so for many years. Their dedicated members pitch in and cook the food, pour the beverages, and serve the desserts. The food is traditional Greek and most tasty indeed. After you’ve eaten, sit back and enjoy the Greek music and dancing. It is a memorable event you can bring the whole family to enjoy. Take time to enjoy a tour of the church and lecture provided by their engaging priest, Fr. Vasili Hillhouse. He’ll describe the splendor of the iconography employed to deepen their member’s religious experience. No matter how many times I’ve heard him speak, I always hear something new. While in the church, look in their gift shop for items found nowhere else in Anchorage. I’ve found books of great interest. Their awesome parish cookbook full of Greek recipes is also for sale within. I’ll be at the festival. Say hello if you spot me! 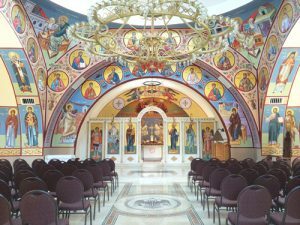 This entry was posted in ADN Articles and tagged Alaska Greek Festival, Fr Vasili Hillhouse, Greek Orthodox, Orthodox on August 10, 2018 by Chris Thompson.